New Orleans native Tim Williamson is fostering entrepreneurship in the city through an innovative nonprofit he helped found. But can the Big Easy get beyond its party-city image to become a place where businesses thrive? 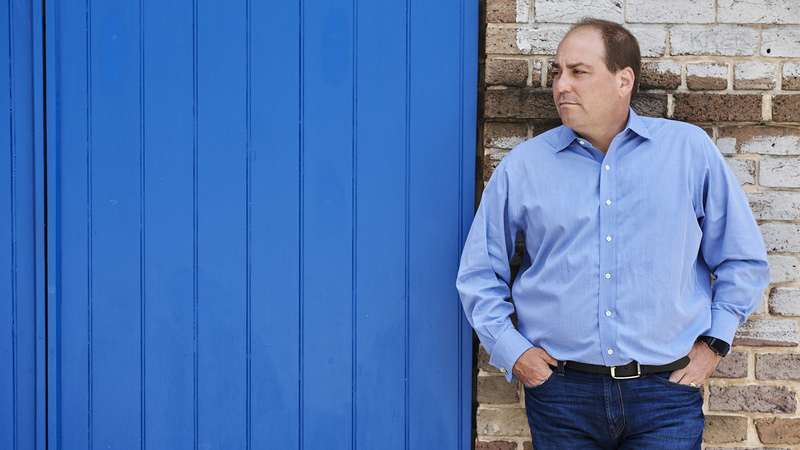 Tim Williamson was born and bred in New Orleans, but after he received his bachelor’s in business from Tulane in 1987, the city didn’t offer enough opportunities for a young would-be entrepreneur like him to stay home. Instead, he joined the management training program at Drexel Burnham Lambert in New York, then went to Bear Stearns in Boston. In 1994, he moved to Atlanta and launched Auducom, a video production studio, before relocating to Pittsburgh to start Pittsburgh.com for Cox Interactive Media. It wasn’t until 1998 that he found an opportunity to move back to New Orleans. Williamson returned to run InsideNewOrleans.com, a website with news about everything from the Saints and Jazz Festival to where to find great gumbo or watch the Mardi Gras parade—all the things he loved. Determined to stay for good, he bought his childhood home in uptown New Orleans in 2011. Eighteen years later, Williamson has helped create the kind of environment that makes other businesspeople want to put down roots in New Orleans. The key to his efforts: The Idea Village, a nonprofit that supports entrepreneurs through consulting and mentorships, operates a lab to incubate new business ideas and hosts an Entrepreneur Week every March that brings in national investors to eyeball NOLA startups. New Orleans Entrepreneur Week is so successful that 55 other organizations are now leveraging the platform to host 119 events to boost investments in the arts, healthcare, education, energy, and women’s and minority issues. With its New Orleans-style street carnival atmosphere, which includes 21 colorful contests awarding money and mentorships to aspiring entrepreneurs, Entrepreneur Week has become a highlight of the city’s cultural scene. At the Big Idea, 10 entrepreneurs pitch ideas to the public right on Fulton, a downtown street known for grand holiday events. People can invest on the spot using $25 chips. Then celebrity judges choose a $25,000 winner from among those with the most chips. Finalists this year included Thinkerella, which organizes children’s parties to teach art, science and math; the Sweat Social, a fitness company for business and leisure travelers; and Scenehound, an app that tells you how crowded your favorite bar or eatery is before you get there. Williamson’s comrades all worked for competing companies that needed New Orleans to be more than a tourist trap. They included Allen Bell of Nola.com and Darin McAuliffe from NewOrleans.com and Turbotrip.com; Greg Meffert from NetEx (later known as Certia), which provides encryption technology for online transaction companies; and Robbie Vitrano of Trumpet Group, a branding and advertising firm. All worried that, just as they were investing in their hometown, other people—a lot of people—were leaving. New Orleans’ population had fallen from about 628,000 in 1960 to about 485,000 in 2000. As an incentive for startups, the five entrepreneurs decided to contribute $2,000 each to create a $10,000 business plan competition. They were gratified when 70 people submitted but were disheartened to realize the lack of resources available to entrepreneurs. So they decided to build a support network for young talent and established the Idea Village to help build a year-round entrepreneurial ecosystem. The mission was to “identify, support and retain” new business ventures. “We wanted to create an entity that no one could own, that no one could control, that was solely dedicated to fostering an entrepreneurial environment,” Williamson says, explaining why they chose to form a nonprofit. In 2005, the Idea Village hosted a pitch competition to put New Orleans entrepreneurs in front of investors. That first event hosted 15 New Orleans companies and 28 venture capitalists from around the country. They gave it a New Orleans flair with a lavish kickoff lunch at Commander’s Palace, the haute Creole restaurant that’s been a city landmark since the late 1800s. The excitement was palpable. But just a month later, in August, New Orleans was underwater. Hurricane Katrina hit with furious winds and rising sea levels, and when the levees broke, entire sections of the city were decimated. The hurricane killed some 1,245 people and caused an estimated $135 billion in damage. Supporters of the Idea Village believed that the post-hurricane New Orleans created an environment that could benefit from their project—a city in great need of a new businesses culture was finally open to one. “The closed, insular networks that existed in New Orleans pre-Katrina were fractured,” Williamson says. The need for entrepreneurship was simply too urgent. Post-Katrina recovery resources also gave them the capital to get restarted. Foundation for Louisiana, which focuses on economic and community development, gave the Idea Village $245,000 between 2006 and 2008. The U.S. Economic Development Administration gave the group $2.2 million between 2009 and 2015. But the key support didn’t come from the federal government, which was raining down money and materials on everyone in the city. It came from individuals. The year after Katrina, Coulter funded a group of MBA students from top business schools, including his alma mater Stanford, to provide technical help to companies in New Orleans. That program grew to include more than a dozen teams. Efforts like those have helped revive business in New Orleans: The metro area’s entrepreneurship rate—at 471 startups per 100,000 adults between 2011 and 2013—is 64 percent higher than the national average and 40 percent higher than other fast-growing Southern metros, according to the Greater New Orleans Community Data Center. In 2010, Coulter inaugurated his own contest for entrepreneurs, the Coulter IDEApitch, an invitation-only dinner and investment pitch, featuring high-growth entrepreneurs from the New Orleans area presenting their ventures to world-class investors. The contest was so successful that the Idea Village stepped in to consolidate the MBA effort into a single week. “Entrepreneur Week was born with MBA teams from around the country coming to New Orleans during their spring break to essentially do free consulting for startups and other companies in New Orleans,” Coulter says. Entrepreneurs attracted to New Orleans with an assist from the Idea Village include Jennifer Medbery, who had taught math in public schools and wondered if there was a better way to process student data. She founded Kickboard, which tracks student achievement through an analytics program. Patrick Comer founded the marketing company Lucid, which he describes as the world’s largest provider of audience demographics for survey and polling efforts. “We wanted to raise a family here,” Comer, whose wife is a native, says about why they moved to New Orleans after the hurricane. “It felt like our duty.” He didn’t expect the business opportunities he found, or the thriving business culture. Today he rides atop a Mardi Gras float as part of Krewe de Nieux, a group of some 30 entrepreneurs who get together to give each other advice and support. Williamson takes great pride in the fact that Entrepreneur Week is now sandwiched between Mardi Gras and the Jazz Festival, prime real estate in the New Orleans landscape. The city’s residents “connect around Mardi Gras; we connect around festivals,” Williamson says. “We never really connected around business innovation or entrepreneurship thinking.” They do now. For more information, contact: Tim Williamson, tim@ideavillage.org, 504.304.3287, ideavillage.org. LIKE TIM WILLIAMSON, PHILANTHROPISTS OFTEN INVEST IN THE CITIES THEY LOVE. HERE ARE THREE OTHER EXAMPLES.